These soft tacos have a beautiful flavor with lots of interest but no serious heat so they’re perfect for family. They’re bright, fresh and a gorgeous blend of textures. Add a bit of sour cream and maybe a little taco sauce, perhaps a side of black beans, and you’ve got a great dinner – and a dinner on the healthy side. If you want to infuse a little more flavor into the chicken you can have it all ready to go the evening before and let it hang out in the fridge until you’re ready to cook. And of course, if you don’t want to grill just make it stove-top. The Avocado Mango Salsa is best made shortly before serving – it can get a little mushy if it sits too long although the flavor’s still great. Chicken Tacos are a great way to stretch a relatively small amount of chicken, but remember to stock up on chicken at sale prices. No sense in spending $4.99 a pound when it can be had at so much less. Package it up in Ziplocs, sized and labeled for specific meals and you’ll save freezer space. If you want to save time, double the spice rub and the breasts and freeze, already rubbed with the dry rub, to cook for another meal, later. Combine garlic powder, paprika, cumin, onion powder, black pepper, salt, cayenne and red pepper flakes. Cut chicken breasts in half, horizontally, then rub the spice mixture over and into chicken. May be refrigerated up to overnight or frozen for later use. Grill or pan-fry until done, two to three minutes per side depending on the size of the breasts. Rest five minutes. Cut into small chunks and place chicken in serving bowl, along with any accumulated juices. Divide into tortillas, serve with Avocado Mango Salsa and lime wedges, sour cream and/or taco sauce if desired. In a medium-sized bowl, add oil and jalapeno. Mash roughly with the tines of a fork to release some of the natural oils in the jalapeno. Add the lime zest and juice, honey and pinch of salt and stir together. Add the remaining ingredients and toss together. Refrigerate until ready to serve. Best served the same day. The peels and normally discarded portions of many veggies and fruits can make a stop on the way to the compost or trash. Use them for your own naturally infused water. You know I’ll be bringing this to our Throwback Thursday #34 Link Party, hosted by Quinn of Dad What’s for Dinner, Meaghan of 4 Sons are Us, Alli of Tornadough, Carlee from Cooking with Carlee and Moi! That’s right – me! I’ll also be bringing this to Angie’s Fiesta Friday #115, hosted this week by Julie @ Hostess At Heart and Ashley @ Too Zesty. This entry was posted in Click here for Bargain Meals, Click here for Fabulous Food Posts and tagged Appetizer, Avocado, Bargain Meal of the Week, Chicken, Chicken Breast, chicken tacos, Condiments, Lime, Mango, Mexican or Southwestern, Red onion, Salsa, Spreads and Dips, Tacos, Tomatoes, tortillas. Bookmark the permalink. Hi Debbie, it was so good; I think it would be amazing with all kinds of things; I could see it on steak tacos or with fajitas, too. This type of fresh and flavorful dish is a favorite. Thank you for posting and I will add some mango to my next salsa. The combination of sweet with hot is a winner. I also like to toss the chicken with some black beans and crisp lettuce or cabbage for a taco salad. 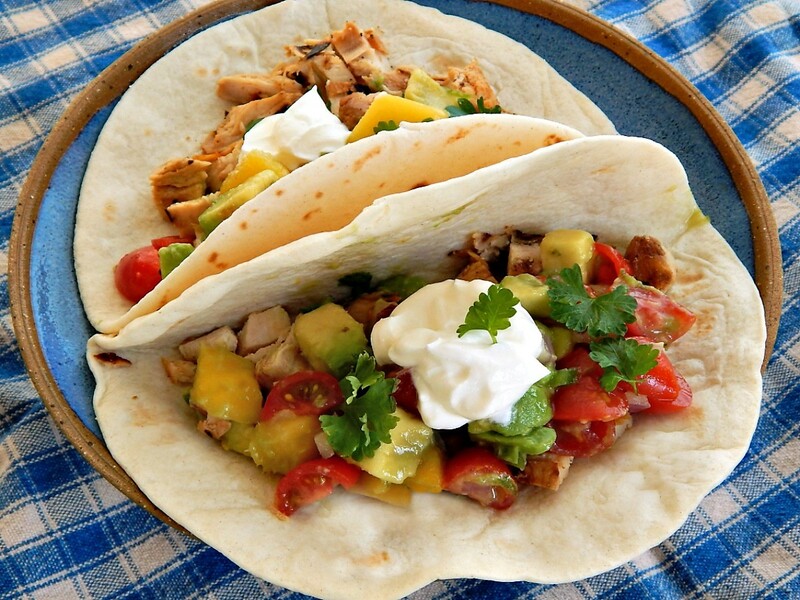 We really enjoy a good grilled taco and your avocado mango salsa sounds delicious! Thanks for sharing with FF! My pleasure! And thanks for hosting FF!